Many of you may have already seen this on twitter but if you didn't I PASSED MY DRIVING TEST!!! I know a lot of you may have passed in your late teens/early 20s so it might not seem like that big of a deal but for me it's massive. I left it to the grand old are of 28 because I was terrified, completely and utterly freaking out at the thought of being behind the wheel. We also couldn't afford for me to learn and to go on Mr T's insurance (he drives a big 2litre diesel) and I didn't want to learn if I couldn't drive afterwards. I know lots of people who pass but don't drive for a long time and then struggle and I didn't want to be in that position. Mr T bought me my provisional for my birthday so really I've him to thank for giving me the kick up the backside that I needed to get started. I'm also very fortunate that he bought me a car too, my little Betty Blue. I opted to learn with LDC cos he and a few friends learnt with them (no this is not a sponsored post, I'm just being honest) and I'm so glad I did. They give you a workbook on your first lesson and it helps so much at the start and with your theory. For someone like me who learns a lot through reading rather than doing I found it helped immensely. I also liked that I could read up on what we would be doing on the next lesson and understand the theory of it before doing the practical. I was shaking on my first lesson and I remember the first time I drove in a straight line. I was creeping along at about 5mph but really it felt like I was going so much faster. Slowly though I got the hang of it and my instructor was so patient with me. If that man can get me to drive anyone can learn. I struggled so much with reversing round a corner (still hate it) but I can now do it and do it well. So what made me bite the bullet and do it? A few things really... I was getting fed up of getting the bus too and from work. It was always packed and on an evening had a habit if coming too early or too late or better still, not turning up at all. I also wanted to learn before I hit 30 which I know is a birthday that is rapidly approaching (less than 18months, sob!). Mr T was quite keen for me to learn (beer taxi) before we have kids cos he didn't want me lugging prams on and off buses and being a real city girl he didn't want me feeling trapped in Otley without a car. So, driving test! It took me three attempts. I know some people don't want to talk about it but I hope it helps anyone else thinking about learning. Yes I'm fortunate that I had Betty Blue to practice in but on the day a lot of it comes down to luck. Test one I had the nicest examiner ever but nerves got the better of me and I stalled the car too many times and clipped a wing mirror. The examiner was so lovely about the whole thing but I still felt awful. It was the first time someone had said "you have failed" and I really struggled mentally with that. The second time I had the worlds worst examiner who was snappy and short with me and as soon as I put a foot wrong he was down on me like a ton of bricks. It was horrendous and then he told me my instructor was wrong about a speed limit for roadworks and I would be holding traffic up, I felt thoroughly run down after that test. I won't go into all the details but I felt more angry that anything but low and behold I got him as my examiner for my third and final test. I was shaking when I saw it was him but my instructor came with us this time and I'm so glad he did. I felt like a I had a comfort blanket in the car having him there. 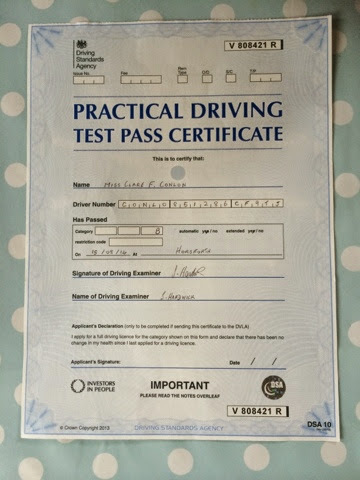 I made a few blips (7 minors to be exact) but I passed! The examiner was nowhere near as grumpy as last time, almost pleasant in a strange way but when I saw it was him I was determined he wouldn't fail me a second time. So now I've passed how does it feel? A bit weird to be honest. I started learning on the 1st March and passed on the 15th August. That's 5 1/2 months and I had 33 lessons. I started of with one a week and after that pushed it up to two a week once I felt more confident. From research online it seems to be that people need at least 40 lessons and I'm putting it down to LDC's teaching methods that got me to pass in that time. Yes I had Betty Blue to practice in but I would avoid going in her a lot cos I was scared. My parents are over this week for a visit and yesterday I drove me and mum in and out of Leeds successfully. Mum can't drive so I knew it was all down to me to keep safe and the car under control and I did it. I chose somewhere that I knew was easy to park on street cos there was no way I'm navigating around a multi-storey just yet. On the way back we wanted to stop at a wee shop in Otley but it was market day so the car parks were rammed and I totally fluffed it up. In the end I gave up and came home but I'm planning on going out with Mr T to practice my parking. Sorry for such a long post but I wanted to share my driving story with you. If any of you are thinking of learning but have yet to pluck up the courage, just do it! Start with one lesson a week and go from there. On a cakey note this means I can go to other local clubs events which I'm very excited about! Ps this post is written on my phone so apologies if the format is a bit weird. I've no access to a computer til later but wanted to get this post up and published asap.